The launch of PETROU\MAN last season deservedly received a fair bit of blog love and we too were excited to see the Cypriot designer turn his hand to menswear for the very first time. For his sophomore menswear collection Nicholas Petrou has stripped away the bodyskins to reveal a texture rich collection. Petrou was inspired by the lives of nomads and applied their travels to his signature mix of sportswear with relaxed tailoring to great effect. We too can be nomads at times or at least it feels like we are when we are travelling so much and Petrou offers an refreshing antidote with this collection. A rich texture achieved through hand dyed prints and combinations of fabrics. I was fortunate enough to visit his presentation at the Drive In Studios and was therefore able to witness first hand the designer's skill in creating a rich, unusual texture achieved through his combination of fabrics and prints. It also allowed opportunity to marvel at the intricate, hand finish detailing including hand dyed tartan suits and embroidered shirts and jackets celebrating the nomads much used tool; the humble safety pin. A close up shot demonstrating the mix of sportswear with relaxed tailoring and hand finish details. There is a terrific sense of texture which is achieved by the layering of different fabrics and prints. There is suede mixed with leather, wool jersey with shearling, microfibre with nylon to name just a few. 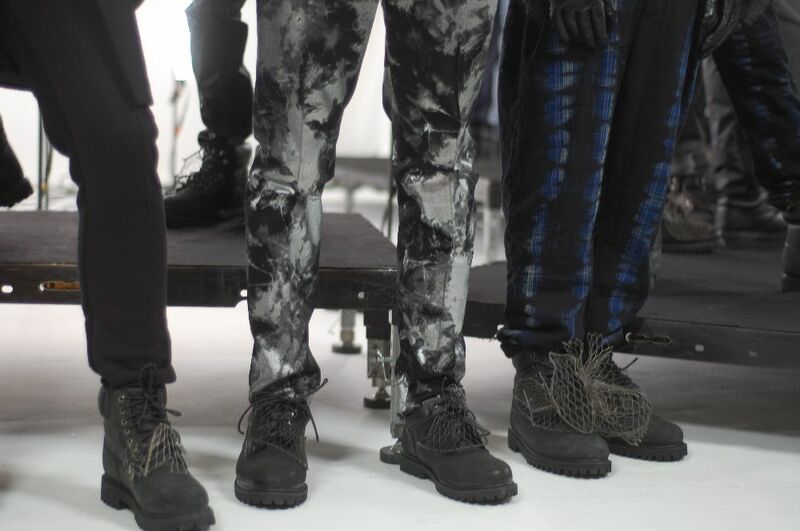 The prints are mostly hand dyed, for example the tartan jackets and trousers, there is a silver jacket which was in fact black but we hand painted it silver. Hand dyed prints and wire embellished boots. 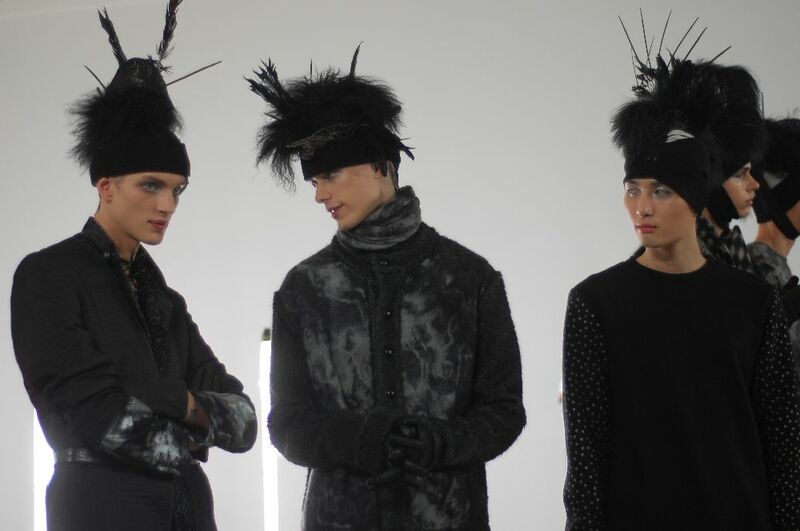 Robbie Spencer styled the show and once again demonstrated that he is one of the most exciting menswear stylists working today. Over the last few days I have been fortunate enough to see quite a few shows and presentations and this ranks as one of the strongest. Every facet of the presentation made perfect sense and the pieces were layered in such a way that every time I inspected a look I discovered a new detail. Petrou's relaxed tailoring mixed with active sportswear. Below Cole Mohr wears a jacket which took my breath away the moment my eyes focused upon it. 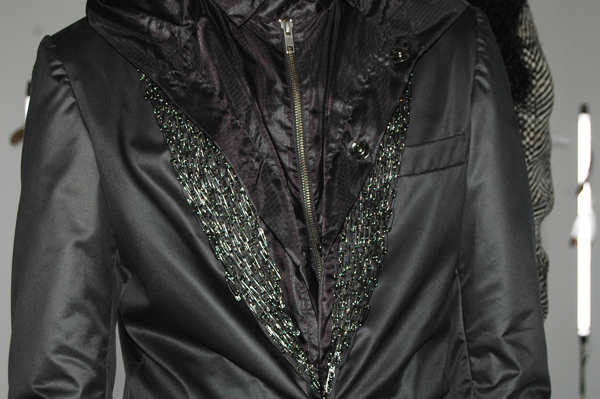 Petrou embellished the jacket with over seven thousand safety pins and it took over two weeks to create. The effects of hand finish detailing is something that might have been forgotten in so much menswear design but this collection by Petrou/MAN is a welcome reminder of its beauty. 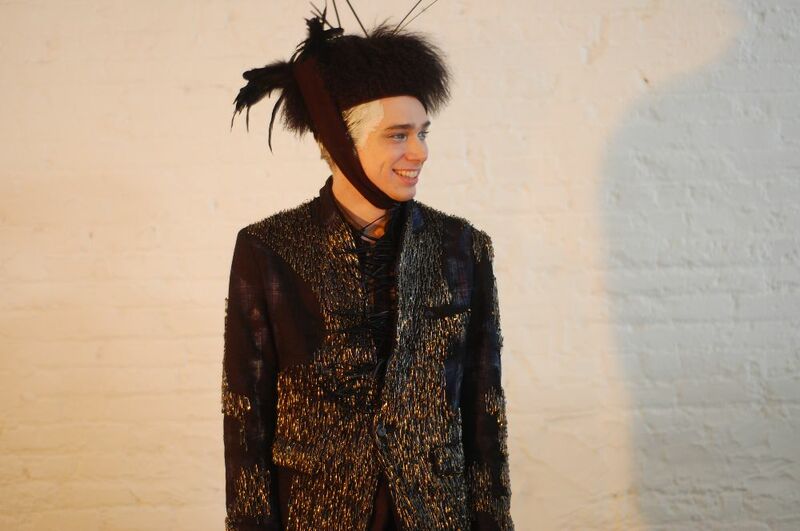 Cole Mohr wearing the statement jacket. (You complained about lack of comments so here's one.) Whoa, from afar the jacket looked like fur. Amazing. I wonder if the boot embellishments are detachable, and how easily a stray wire end might poke you. 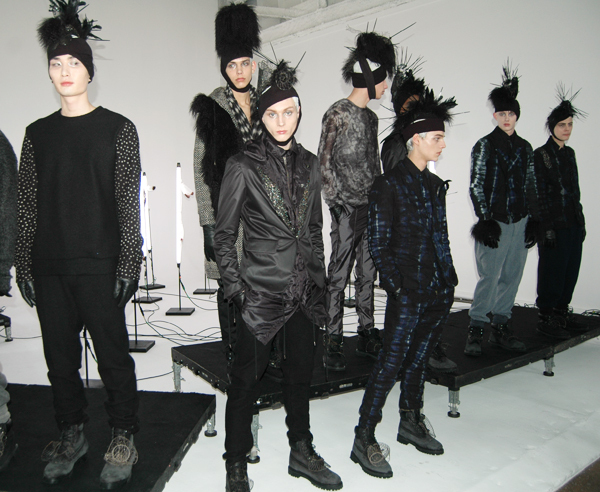 I would have really wanted to see this collection in person; it's the only way to appreciate all the textural wonder. ok, on what planet would this ever look relevant? I'm sorry but it looks cheap and badly put together. just not my idea of pushing the envelope in the right direction. lboyd- what do you think is the 'right direction'?